PANZER KASERNE U.S. ARMY BASE, Germany — Perhaps you’ve heard: Sgt. Maj. Carlton Kent likes to run. 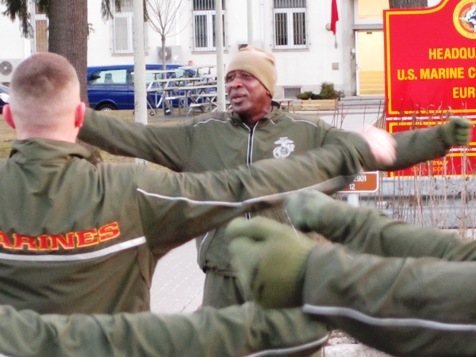 The longtime marathoner and senior enlisted adviser in the Marine Corps led Marines with the headquarters of Marine Corps Forces Africa and Marine Corps Forces Europe in a motivational run early Tuesday morning. The pace was pushed to something far quicker than most Marines expected to see in a simple early-morning run. A group of about 40 Marines and your faithful Marine Corps Times correspondent stepped off at about 6 a.m. from the headquarters aboard this base, which translates in German roughly to “tank base.” That’s what the Nazis used it for during World War II, long before the fall of Adolf Hitler’s regime. It’s a far different place now. Many of the roads are still cobblestone, but the base has plenty of modern facilities, including a relatively nice PX store. However, that didn’t save them when Kent turned on the juice as Marine running cadences were sung with few interruptions. “That’s the fastest moto run I’ve ever done,” said one gassed gunnery sergeant after it was over. A few other Marines were escorted into a van after they couldn’t hang with the main pack. For what it’s worth, I hung in there. As a desk jockey civilian journalist, I was the only one who wasn’t wearing a Marine running suit during the event. 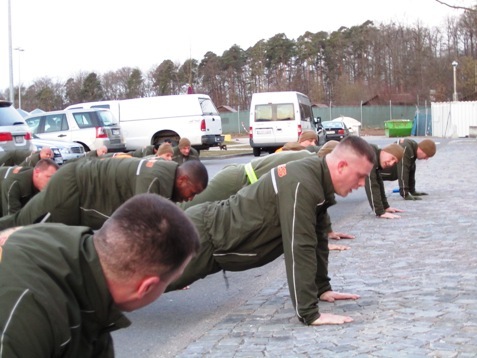 I won’t pretend to be ready to dominate a Combat Fitness Test tomorrow, but I had several Marines behind me in the pack and finished in plenty of time to take the photograph you see above. It’s the small victories, friends. It’s the small victories. Get some! I enjoy the first person reporting in this article, especially. Gotta love Sgt Major Kent! Good article Dan – not bad for a civilian. Doesn’t the Marine Corps Times have a Marine advisor on staff? If not, give it some consideration for credibilities sake. I wonder, when the american garrisons in Germany will leave the country? The Germans don’t like that kind of people on German soil.